Patient Lift systems allow safe transfers of a person from one location to another with the help of a motorized lift system. The lift can be portable and moved from one location to another or a fixed to a stationary track. There are many track options as well: ceiling mounted, free-standing post systems, and wall-mounted. Call us for help to find the best system to meet your unique needs. 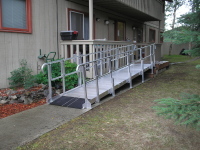 Ramps systems can be an easy and convenient way to create access in and out of your home. Portable aluminum ramps can fold up into the size of a suitcase, and larger modular ramps can be designed to fit almost any configuration. 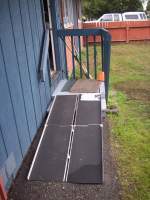 We can also provide threshold ramps to eliminate uneven transitions at doorways. Maximum slope of 1:12 is the standard for permanent ramps. This requires 12" of ramp for every 1" of rise. The preferred slope is 1:16, but sometimes space will not allow for constructing ramps long enough to accomodate the 1:16 slope. ADAAG (A Guide to the Americans with Disabilities Act Accessibility Guidelines) calls for the "least possible slope to encourage more gradual slopes which better serve children and people with limited stamina or upper body strength". Source: ADAAG Manual. Statistics tell us that most accidents happen in the home. 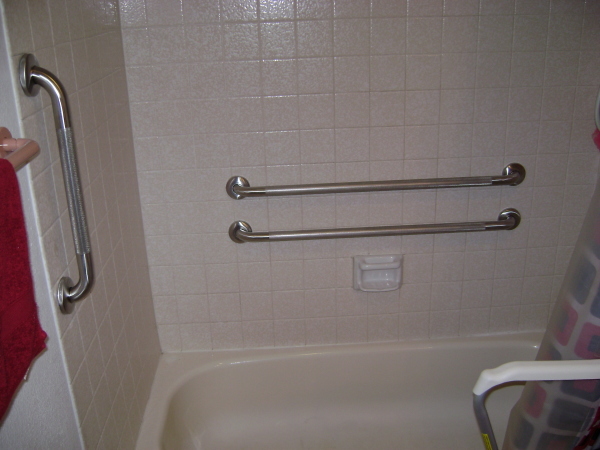 The best way to prevent injuries in the bathroom is to install grab bars and or other safety items as needed. Some of the commonly installed items are: grab bars for shower/tub area, grab bars near the toilet, specialty grab bars (fold-up, L-shaped), floor-to-ceiling poles, raised toilet seats, toilet safety frames, hand-held showers.